Don’t you just love all the sweet, handmade Mother’s Day craft ideas? I especially love all the ones with cute sayings for moms. We have done many over the years using handprints, footprints, and fingerprints. They make such precious keepsakes. Even babies can get involved with prints of their feet while toddlers and older can add their own words and creativity. 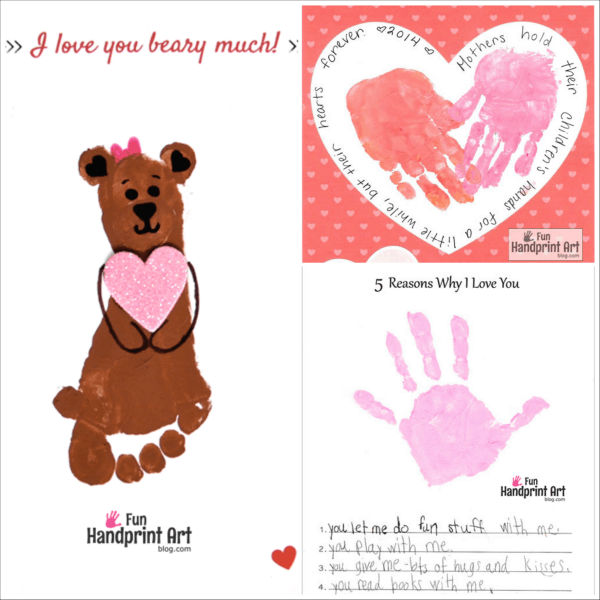 Here is our main page with all our free Mother’s Day handprint printables. Be sure to keep checking back year after year as we add more! 5 Reasons Why I Love You Card Idea – Simple prompt for kids to tell mom some of the reasons why they love her. Handprint Flower Pot Template – Features a cute Mother’s Day saying on the pot. Handprint Heart Template Write a sweet saying to Mom in the shape of a heart! Printable Vase Template – Mother’s Day drawing and writing prompt. Kids can decorate with fingerprint flowers or draw them on. Fingerprint Cards for Mother’s Day – Use the templates to create different cards. Handprint Butterfly Poem Keepsake – This makes the sweetest gift! My son’s is laminated and has yarn attached for hanging on the wall.